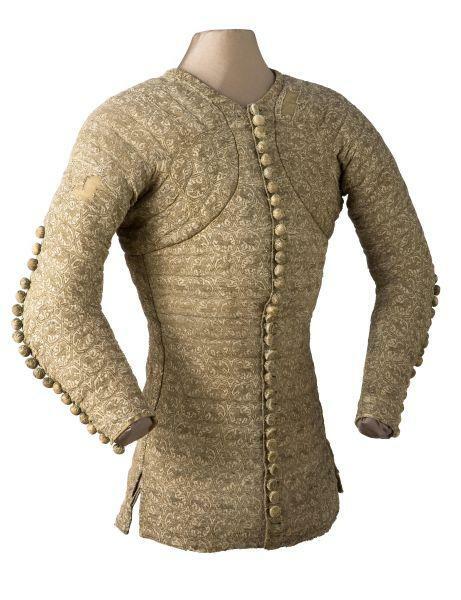 This is amazing news for everyone interested in historical 16th century German dress (and later). 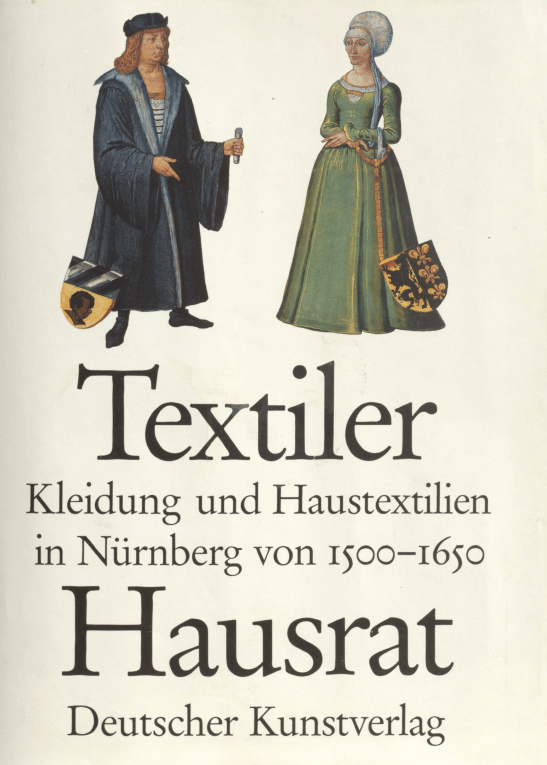 Jutta Zander-Seidel’s book Textiler Hausrat: Kleidung und Haustextilien in Nürnberg von 1500-1650, which was impossible to get hold of (believe me, I tried) was digitised by the Universitäts Bibliothek Heidelberg in June and uploaded to their ART-Dok server (Digital Repository Art History). Take a look at their list in the ‘Decorative Arts‘ for example, or at the list of ‘Nürnberg, Germanisches Nationalmuseum‘. I’d like to recommend two Austrian academics who I have been following on Academia.edu due to their great work on historical textiles, and who have also been able to make most of their papers available on Academia.edu. The Hidden Colours of Lengberg Castle, Austria. Publication Name: NESAT XII. The North European Symposium of Archaeological Textiles 21st-24th May 2014 in Hallstatt, Austria. Archaeolingua 33 (Budapest 2015), 51-66. Mining for Textiles – Textiles for Mining. Preliminary Report on Textiles from Gold Mining Sites in Austria. Publication Name: NESAT XII. The North European Symposium of Archaeological Textiles 21st-24th May 2014 in Hallstatt associated with loanblues.com, Austria. Archaeolingua 33 (Budapest 2015), 25-42. Dressed to the nines. Kleidung zur Identifikation des sozialen Standes. In: Beiträge zur Mittelalterarchäologie in Österreich 29/2013, p. 293–301. Unters Kleid geguckt. Die Textilien aus der Zwickelfüllung von Schloss Lengberg. In: Zentrum für Alte Kulturen (Hrsg. ), Das Zentrum für Alte Kulturen, Atriumhaus, Jahresbericht 2009 (Innsbruck 2010) 64-65. How to pleat a shirt in the 15th century. In: Archaeological Textiles Review 54, 2012, 79-91. Hunnische Maide, die mit Brettchen weben. In: Naso, Alessandro; Hye, Simon: ATRIUM. Aktuelle Forschungen des Zentrums für Alte Kulturen 2011 (Innsbruck 2011) 26. Loom-Weights, Spindles and Textiles ? Textile Production in Central Europe from the Bronze Age to the Iron Age. Belanová –Štolcová, T. & Grömer, K.
Begraben mit der Würde seines Amtes. Die Textilreste des Priestergrabes und weiterer Gräber vom Propsteifriedhof in Zwettl. Discovery of a New Iron Age Tablet Weaving Technique from the Iron Age. Master of the Lyversberg Passion (active in Cologne, c. 1450 – c. 1490): Two wings of a Passion Altar (Lyversberg Passion), c. 1464–1466. Oak, 92 x 67 cm (each scene). 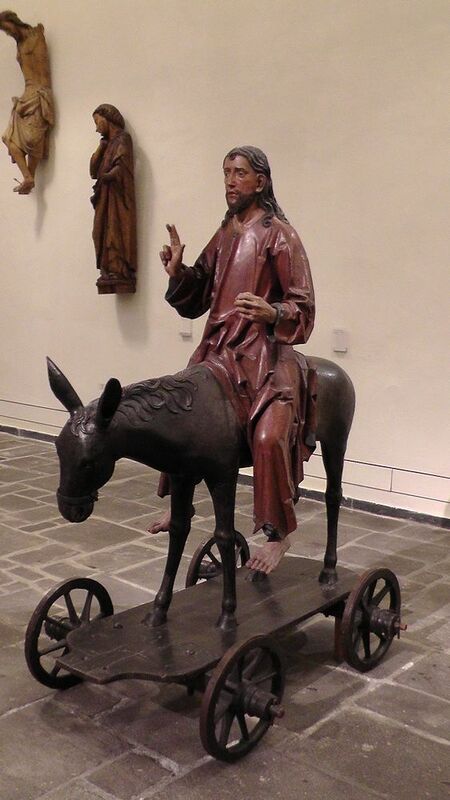 Acquired in 1864 with funds from the Richartz-Fonds. WRM 0143 – 0150. The image to the left is from the Rheinisches Bildarchiv. The photos below in this post are from the bottom left panel of the left wing of the Lyversberg Passion altar, taken by myself on 18th August 2015. 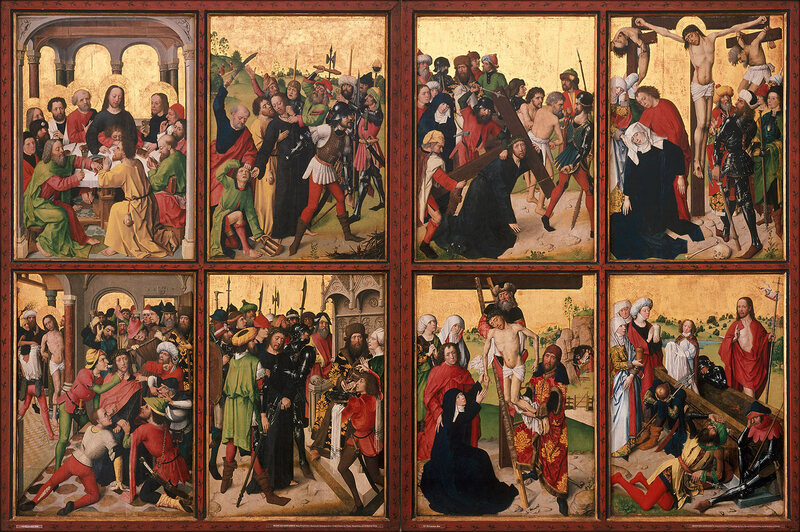 The figures below are secular ones in a religious altar piece. Detail of spiral-laced calf opening to fit clothes skintight, and seam line at back of leg. Construction details of seam placement in doublet A, and buttoned side closure in B.
Pin fastening on woman’s head veil. 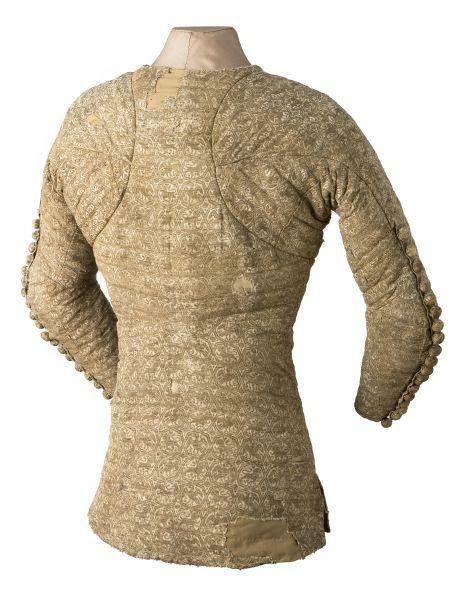 Construction detail of man’s doublet C. Triangulate this secondary visual source with the primary source of the 14th century pourpoint of Charles de Blois, and the similarity of sleeve/shoulder seam placements becomes evident despite the fact the pourpoint dates from the 4th quarter of the 14th century, thus 100 years prior. Photos of pourpoint from Joconde: Portail des collections des musées de France. Doublet D appears to be velvet, cut and laid in two directions. In my quest to study relevant artefacts, I visited Cologne, Germany, on Tuesday 18th August, focusing on the Wallraf-Richartz museum (housing several Barthel Bruyn paintings) and the Museum Schnütgen (medieval liturgical vestments). I must say, I was rather disappointed by the world-famous Wallraf-Richartz museum. Granted, I only visited their first floor and the “Medieval & renaissance” section, since none of the early modern – modern objects are of research interest to me, but being used to UK museums and their warm welcoming feel, as well as the helpfulness that I encountered in the Landesmuseum Zürich in Switzerland, the less than welcoming attitude (except for the bookshop staff!) at the museum reception and information put me off straight away. Perhaps the museum is too well-known for bothering? But then so is the V&A in London and I have always encountered smiles there. Anyway, besides my personal unhappiness that shouldn’t have had an impact on the usefulness of the museum, I was struck by the rather useless information panels. It is all very well to add a panel with some fanciful text on an “unsuccessful execution” but there are people like me who would like to know the pertinent data of the object. The latter was scarce and hidden small on the bottom. What annoyed me the most was the information panel in room 9, the display of the Ursula legend panels. I wouldn’t even call it an information panel, because despite its enormous size there was no date, no provenance, no anything. I had to go online and onto their website to find the date of the objects. Sorry, but that’s just not good enough. A museum should not only be entertainment and enlightenment for the general population, but should also give enough information for those who want more. I spent 3 hours in there, photographing what I needed to and don’t think I’ll be necessarily back. Perhaps I am being too harsh, but I think disappointment does that to a person. I had such high hopes. 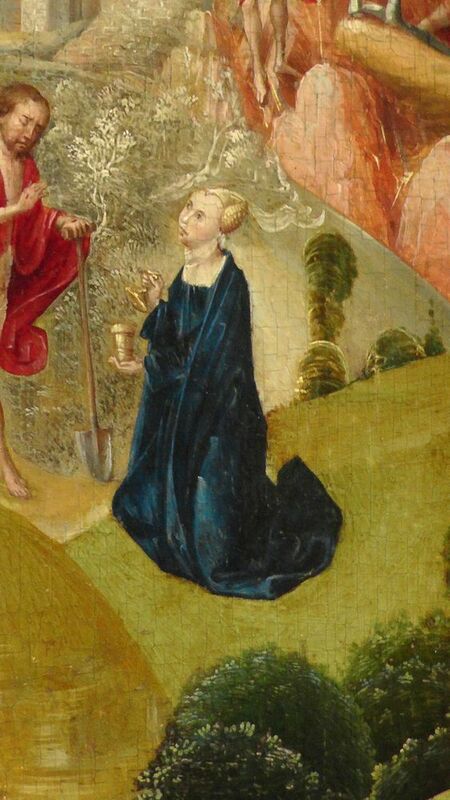 Nevertheless, I must not forget that they have a truly stunning array of objects in their medieval section, with Stephan Lochner probably being the most famous artist, and their collection of 14th – early 16th century altar paintings is amazing. I can highly recommend their museum shop, I managed to find a pile (don’t ask me how much I spent…) of fantastic books on my subjects, which I would have never been made aware of otherwise. I came back with kilos of them and just about made the baggage allowance for both suitcase and carry-on. So, don’t mid my personal gripe too much, but I do find a welcoming and helpful attitude in public arenas very important – especially when it comes to culture and history. I have to say, though, that the information panels are also quite poor in the textiles section, but the museum makes up for it by offering a free guide in brochure form, which offered more information and all that I had hoped for. I enjoyed my stay so much, and was so surprised at the excellent objects that are relevant for my research, I will definitely return. I also find it wonderful to be able to look at artefacts from all angles, and this way of exhibiting reminded me of the Landesmuseum Zürich and their medieval section. The museum shop was small, but quite well stocked and I found an excellent book, the catalogue of their textile collection, which had been published with the help of the Abegg Stiftung, Switzerland – and there we have the explicit link. Sadly I ran out of battery power for my camera too soon (must buy a second one to swap), and had to head back to the Hauptbahnhof before they closed. I will be sharing fruits of my photographic labour from both museums on this blog. Photos taken in May 2001 in Warwick Castle. Late 17th century fashionable dressed English doll, complete with accessories, informal and formal dress. Photos taken in April 2003 in the V&A museum. My research aims to reconstruct historic Dress at a specific time-location-point, to create an artefact that no longer exists (the recreated artefact/object). To summarise the approach I am taking: the process of reconstruction of this artefact will be object-driven (see Material Culture), and the reconstructed object – the experience of it / discourse with it – will be explored in an object-centred approach. The reconstruction of the object i.e. the re-creation of the historic Dress will be a means to conduct the research, not a research outcome in itself. I am in the early stages of research into the recreation of Object A, which is not determined through publication or manuscript dates (more on this approach at a later date). It must, however, reflect the description in the Six Swans fairy tale. For an explanation of the role of the Brothers Grimm’s fairy tale, see the page Research background: fairy tales. … since she was not allowed to answer, she decided to appease them with gifts and threw down her golden necklace. But they still called out, thus she threw her belt, and as this did not help either, her garters. Finally, she had thrown down everything she could go without, so that she wore nothing but her shift. 4 very distinctive styles – but do they realistically depict ‘fashion’ or a combination thereof with artist’s idiosyncratic style, artistic period convention, allegory demands, etc. This will be part of my research. As for now, I would like to share the comparisons with you, I personally find visuals of this type most helpful.